Announcement Free shipping April 20 - May 4, wishing all of you Spring Joy! 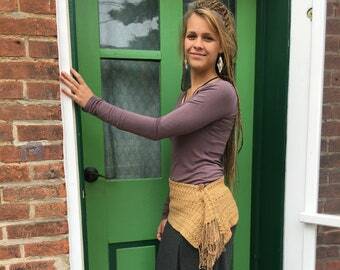 Welcome to my shop of handmade fiber clothing, created with natural dyes and natural fibers, inspired by the earth, her rhythms and cycles, and the red thread connecting the past, the present and the future. My creations are made in the rhythm of the earth, inspired by the colors, seasons and dye plants available on the land around me. The red thread is the red blood that runs through our veins, giving us life, nourishing us, connecting us to mother, father, sister, brother, grandmother, grandfather, ancestors down the line, the roots of our family tree, which root us into the sacred soil that also nourishes us, as our blood in turn nourishes the soil through our sacred toil. It is with pleasure and a commitment to live in wholeness and beauty, with music, soul, creativity, passion and joy rooted in inspiration and the traditions of my ancestors, that I create these handwoven adornments. 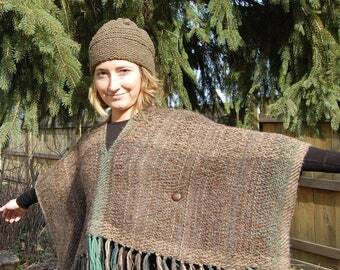 It is my hope that earth medicine shines through my handwoven fiber creations. Free shipping April 20 - May 4, wishing all of you Spring Joy! This is my second hat by Innerspiral. Texture and colors of yarn are fabulous! This cowl is very thick and warm and the colors are very soft. An easy piece to wear with a coat. And, again, quality is excellent. This my second wrap like this. It’s very stylish and the perfect piece to top off an outfit. Erin ships out on time and communicates the status of your order throughout the process. 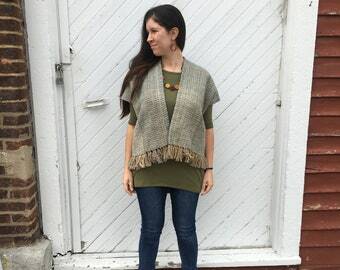 This shawl is a nice size that can be worn all four seasons. 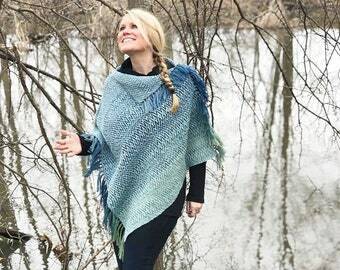 Erin’s weaving and hand dyed fibers are top quality. I am very happy with my purchase. 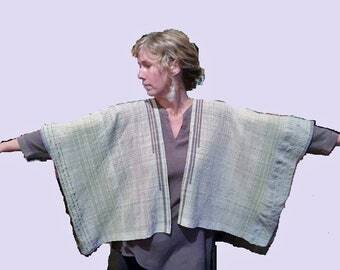 This capelet is wonderful! The autumn colors are vibrant, the style is very cute on and the wood button is the perfect finishing piece. Love Erin’s work! Quality weaving and beautiful colors. 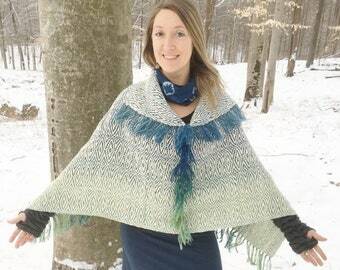 This infinity wrap is adorable on! I had to purchase another one in a different color because I love it so much. 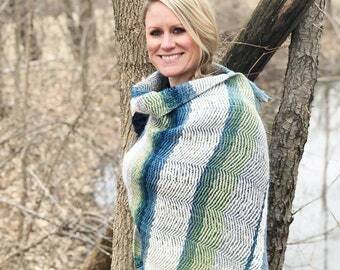 The fibers, texture and colors of the wrap are stunning. I like the fact that the yarn is hand spun and dyed naturally. Erin’s weaving is high quality and she is great to work with. Erin’s work is amazing. 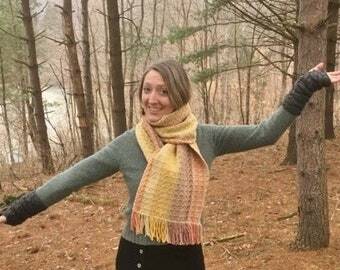 The colors in this scarf are wonderful and the quality is excellent. The quality of work in this infinity scarf is excellent. Seller shipped out on time and communicated with me concerning its status. I purchased the golden sands hat. The textures and colors in this hat are lovely. Erin provides a quality product. 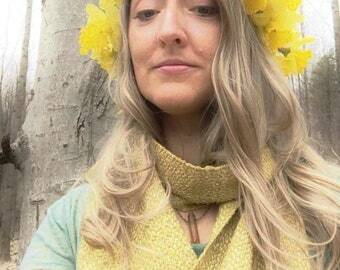 Thanks for checking out my earth-medicine-weavings. Yes, medicine can be found in the colors and fibers we wear! 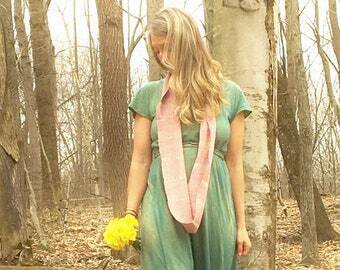 I use only natural fibers and natural dyes in my creations, always striving to be in harmony with the earth. All of my items are handmade by me with much heart and soul. I will happily accept them back if you are not happy with them, if you contact me within a week of receiving, and if the items are in the same condition as when received. You will be responsible for return insured shipping. Once I receive the item back, I will refund the cost of the item, but not the shipping either way. I ship all items with insurance. This is included in the shipping cost, which is why I ask that you contact me first so that I can get accurate shipping costs for your item and your location. If you don't contact me first, know that there may be an additional charge (or credit) for shipping difference.